Handcrafted from real quarried stones, each color from a different South Pacific island. Our artisans select from thousands of pieces of rough quarry stone, then meticulously cut, shape, and grind them to form the overall design. Once the design is completed, the stones are polished until smooth and shiny. A combination of natural plus high performance modern materials allows us to make a top that you may use indoors or out. 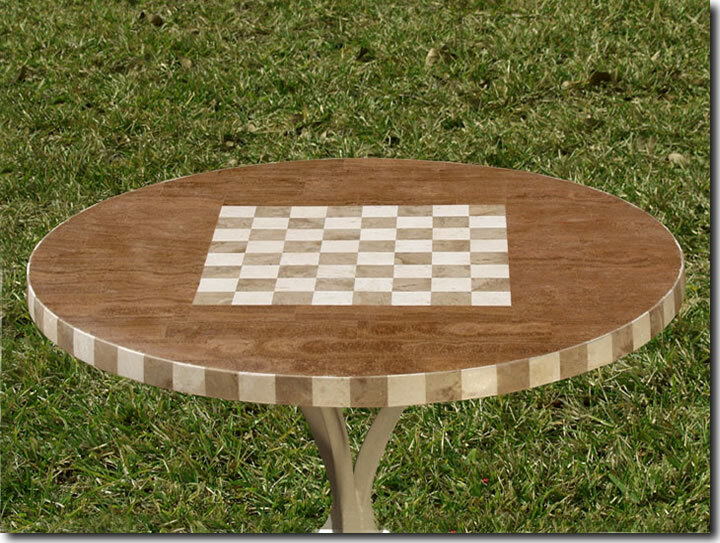 The GameBoard Table Top comes in 24" round, 30" round, 48" round, and 25"x38" oval sizes. Photos of all top sizes are available upon request. Other sizes are available by special order, contact us. All sizes of Atelier stone tops are a generous 1-1/4" thick. All tops are fully finished in smooth highly polished stone - no rough stones, rough edges, or grout lines. Bottoms are fully finished in smooth stone to 1-1/2" from edge - no rough surface to touch. Atelier tops fasten to any type of table base with standard stainless wood screws.